Yesterday, I posted about trying to find more toddler-ish finger foods for Ginny. 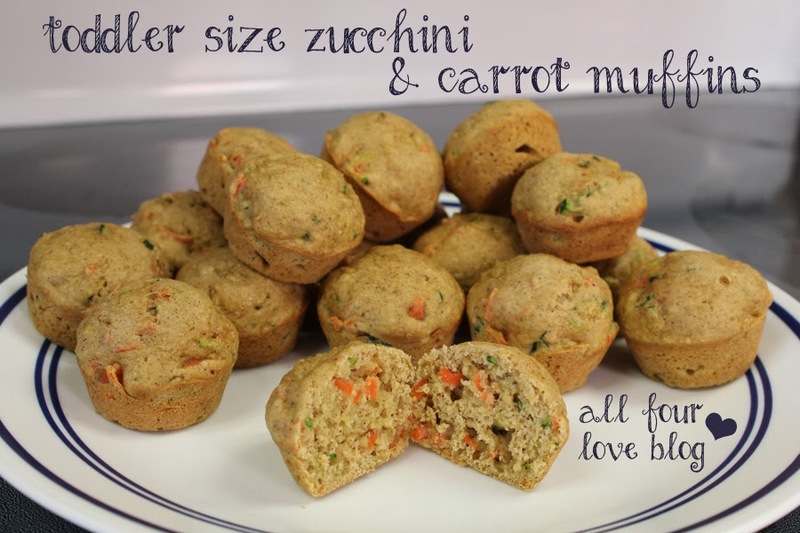 I got the idea to make up some mini veggie muffins using my Mom's zucchini bread recipe. This recipe has been around for as long as I can remember. We used to make loaves of bread as gifts for neighbors and friends around the holidays. The original recipe was delicious, but not super healthy; it called for a lot of sugar and oil. Again, definitely delicious, but for this purpose I wanted to make it a little more kid friendly. Here's what I came up with and so far the kids love them! Charlie calls them "cupscakes." Veggie muffins instead of cupcakes? Sure kid! Prep a mini muffin pan. I used Pam baking spray, but you can use oil/Crisco and flour. Just get it good and stick resistant. Preheat oven to 350*. In a large bowl, mix flour, sugar, cinnamon, baking soda, baking powder, and nutmeg. In another bowl, mix egg, zucchini, carrot, applesauce, and lemon peel. Add to dry mixture. Put one heaping teaspoon full of batter in each mini muffin cup. Now, you're not supposed to eat batter and all that jazz, so I don't condone the consumption of raw egg and yadda yadda. If you DO happen to be a daring batter eater, I must warn you - this batter is freaking delicious. Bake for 11-13 minutes. Try not to over bake or they become dry. One batch of batter makes about 2 dozen mini muffins. The fun part about this recipe is that you can swap out the zucchini and carrot for apple or banana or you can swap out the applesauce for pumpkin puree. You can add cranberries, chocolate chips, or granola. Use your imagination! I plan on sending these little muffins to daycare as a snack or part of lunch. Stick them in the freezer and pull them out the night before you need them!